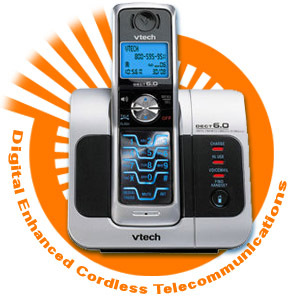 Digital Enhanced Cordless Telecommunication (DECT), the technology originated as a European initiative is now rapidly conquering the telecommunications world. The benefits offered by this high quality access technology are recognized by more and more users, regulators, standardization bodies, network operators, and equipment manufacturers. DECT has proven multiple applicability as a network access in residential, business and public environments showing easy mobility, speech quality comparable to wireline telephony, a high level of security through advanced digital technology and encryption, allowing for high subscriber densities, flexible bandwidth allocation, multiple service support, cost competitiveness, flexible deployment and simple installation. DECT operates in the preferred 1880 to 1900 MHz band using GFSK (BT = 0.5) modulation. DECT has been designed to provide access to any type of telecommunication network thus supporting numerous different applications and services. The range of DECT applications includes residential, PSTN and ISDN access, wireless PABX, GSM access, Wireless Local Loop, Cordless Terminal Mobility CTM, Local Area Network access supporting voice telephony, fax, modem, E-mail, Internet, X.25 and many other services in a cost efficient manner. Although network-wide mobility is outside the scope of the DECT standard, the mobility functions in the DECT standard provide the ability to access the mobility capabilities of telecommunications networks through a (multi) cellular infrastructure giving tremendous flexibility to users roaming across their residence or business site. Wireless users with authorized access to the network (subscribed users) can make and receive calls at any location covered by the DECT infrastructure (if the infrastructure supports mobility) and move around in this area even when in active communication. When the radio channel is interfered, the seamless handover capability of DECT assures an unnoticeable escape to a newly selected non-interfered radio channel. DECT features continuous Dynamic Channel Selection and Allocation. All DECT equipment is obliged to regularly scan - its local radio environment - at least once every 30 seconds. Scanning means receiving and measuring local RF signal strength on all idle channels. A DECT base station is continuously transmitting on - at least - one channel, thus providing a beacon function for DECT portables to lock-on to. The base station’s beacon transmission carries broadcast information - in a multi-frame multiplexed structure - on base station identity, system capabilities, RFP status and paging information for incoming call set-up. The coexistence properties of radio access technology mainly rely on the ability to escape (handover) - in the frequency domain - from the interfered radio link, not relying on information transferred over the original (interfered) channel. MC/TDMA/TDD, continuous Dynamic Channel Selection and Allocation and the handover procedures in the DECT standard show excellent coexistence properties even under heavy interference conditions. The use of a radio access technology providing mobility includes considerable risks with respect to security. The DECT standard provides the measures to counteract the natural security flaws that generally appear when applying cordlessness. Effective subscription and authentication protocols have been included to prevent unauthorized access and an advanced ciphering concept provides protection against eavesdropping. Furthermore, the standard reflects a high degree of flexibility in the protocols to enable future extension.